1 Billion. One thousand million. Any way you count it, that’s a bundle! And at the US Government Printing Office Document Distribution Center in Pueblo, Colorado, we have reached that magic number. As of today, our Pueblo facility has shipped over 1 billion consumer publications, making it a bundle of bundles sent out to the American people! Growing up, I always heard or read public service announcements from the Federal Government offering helpful advice on everything from how mortgages work to getting vaccinations. Each time, the commercial or ad would end with the same tag line: “To order this helpful free publication, contact us in Pueblo, Colorado” and an address and phone number (and today, a website address) would be given with ordering information. I thought it amazing that all this great consumer information was available from one Colorado town. Although unbeknownst to me at the time, it turns out this famous Pueblo location is actually one of two distribution facilities operated by the Government Printing Office’s Agency Distribution Services that stores and ships out Government publications on behalf of our Federal agency clients to the public –the other being in Laurel, Maryland. In an effort led by House Appropriations Committee member Congressman Frank Evans, the GPO distribution facility was proposed and then approved on October 8, 1970, by the Joint Committee on Printing and the 15th Public Printer of the United States, Adolphus Nichol (Nick) Spence. The Pueblo Public Documents Distribution Center (PuDDC) was dedicated on October 8, 1971, and opened on October 11, 1971, to provide support for the expanding dissemination needs of Federal agencies, from books to posters to other products. 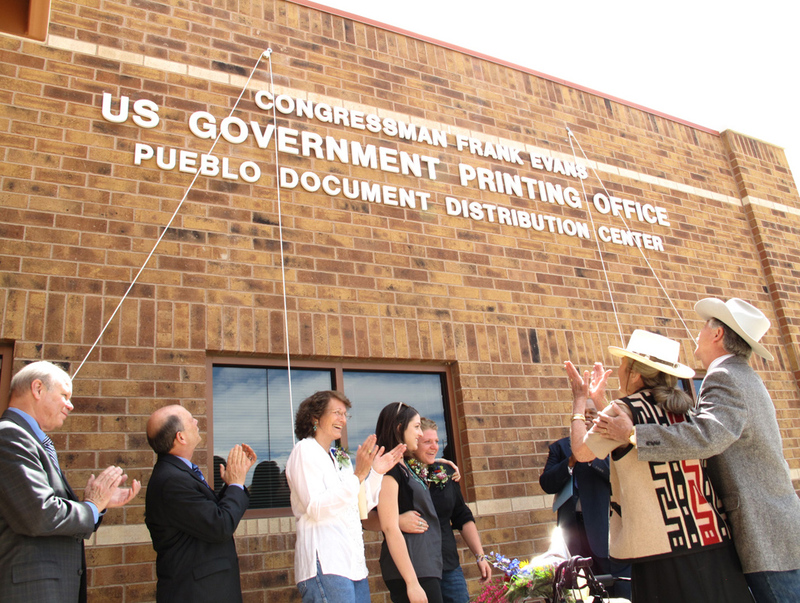 Last year, President Barack Obama signed an act of the 111th Congress to rename the center the “Congressman Frank Evans US Government Printing Office Pueblo Document Distribution Center” after the former Congressman who passed away in June of 2010. It was re-dedicated on October 11, 2011, for the fortieth anniversary of the Pueblo facility. Image: Renaming ceremony of the GPO Pueblo facility on October 11, 2011. Today, GPO’s Pueblo Document Distribution Center provides distribution services to 10 federal agencies and other entities including: The Federal Citizen Information Center (FCIC), the Federal Trade Commission (FTC), Health and Human Service (HHS – Women’s Health), Office of Disability Employment Policy (ODEP), Federal Drug Administration (FDA), Federal Depository Library Program (FDLP), Consumer Financial Protection Bureau (CFPB) and three programs within the Department of Homeland Security that produce items such as Transportation Security Administration (TSA) posters, bookmarks and baggage inserts. The Pueblo Distribution Center has processed over 105 million customer orders from the day it opened its doors through the end of April 2013, and as of today, May 2, 2013, the Center has distributed over 1 billion publications on behalf of its various Federal clients. The Pueblo facility really got a kick-start when it signed an inter-agency agreement with the General Services Administration (GSA) in January of 1973 to take over the warehousing and distribution of the millions of printed consumer publications being provided through GSA’s then-new Consumer Information Center (or CIC), which itself has provided service to the GSA’s Federal Citizen Information Center (or FCIC), the U.S. Postal Service and the Department of Education. 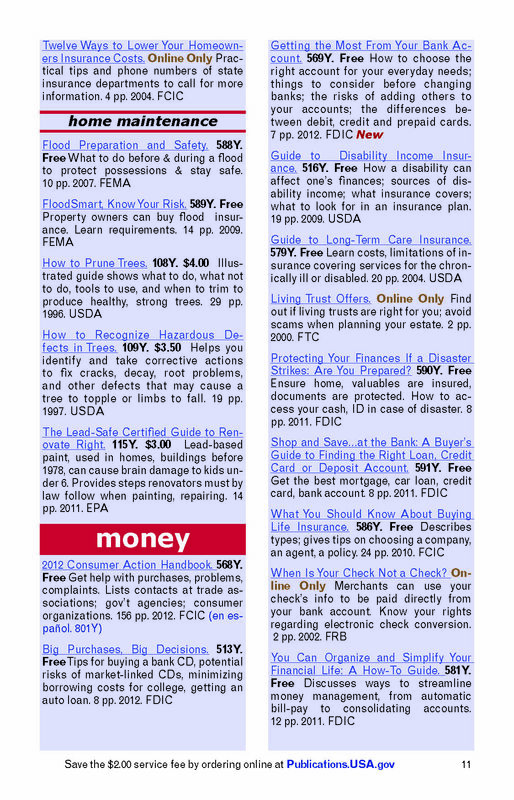 The gem in the FCIC’s crown is the Consumer Information Catalog, printed by GPO, which lists the latest and most popular of the many thousands of consumer publications available by topic and is updated several times a year. Most of the print publications–the majority printed by GPO– in the Consumer Information Catalog are FREE for U.S. delivery if ordered online; the rest require only a nominal fee. Plus, a number of the publications are offered for FREE in electronic format for immediate download on the Publications.USA.gov website. Some of the many categories of helpful consumer pamphlets and publications include: Education; Employment; Family including Pets; Federal Programs and Benefits, Food; Health including Drugs and Exercise & Diet (even information on braces, tattoos, and tanning! ); Housing including Financing and Home Maintenance; the ever-popular Money category including Fraud, Credit Cards, Living Trusts, and Retirement Planning; even Small Business and Travel, and more. Image: Page from the Consumer Information Catalog Winter/ Spring 2013 Edition. How can I get a copy of the Consumer Information Catalog and order publications? 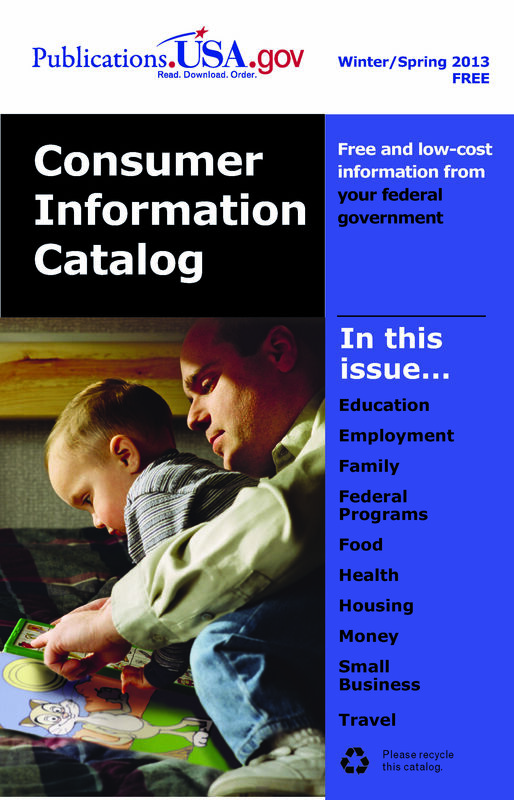 Find the latest Consumer Information Catalog in PDF format online, or you can also order FREE print copies to be mailed to you at the same Publications.USA.gov website. 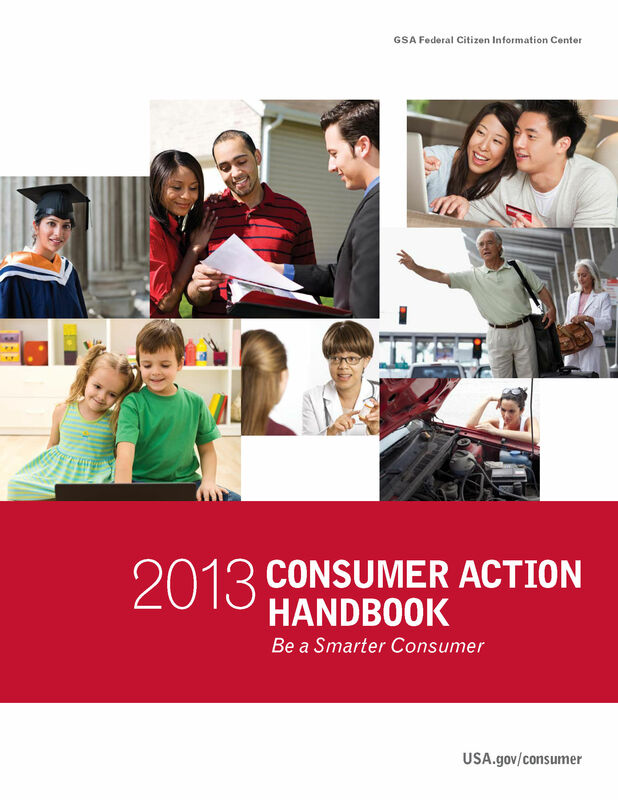 The most popular document distributed by Pueblo remains the annual Consumer Action Handbook, a free trouble-shooting guide to help Americans solve all sorts of consumer problems. I’ve ordered five to share with family and friends! In addition to ordering from GSA’s Publications.USA.gov website, you can find a number of these consumer publications on GPO’s US Government Online Bookstore. You can also browse our Consumer, Home & Family category on our online bookstore. 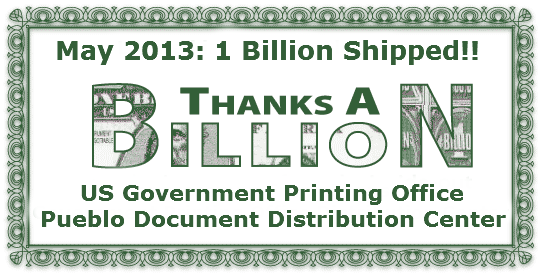 With so many useful consumer publications available from the Federal Government, I’m sure it won’t be long until we distribute another billion items to help American consumers! You are currently browsing the archives for the General Services Administration (GSA) category.